LAKEVILLE, IN. – Junior Jimmy Fischer came up big in Saturday’s game against visiting West Noble. 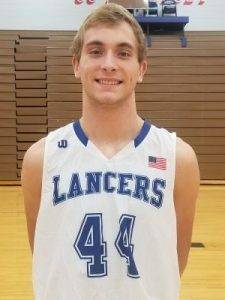 All the 6-foot-2 forward did was contribute a solid 13 minutes, score four points on 2-of-2 shooting, haul in six offensive rebounds, and dish out an assist to help Class 2A #7 LaVille edge past West Noble, 60-59. 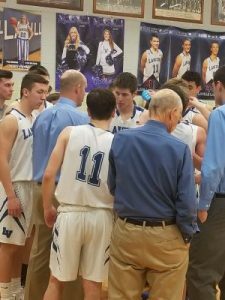 Fischer started his impact on the game by grabbing an offensive rebound to keep a crucial LaVille possession alive early in the fourth quarter. Later, Fischer assisted Luke Beehler on a bucket to put the hosts up eight points with 5:27 left. Three minutes later, Fischer grabbed another big offensive rebound that led to a 3-point basket by Jared Beehler. Fischer picked up the intensity when he out jumped a pair of West Noble rebounders for an offensive rebound and put back that puts LHS up 58-54 with 1:21 remaining. Then, with 12 second left Fischer collected another offensive rebound. West Noble did get one final possession with 3.8-seconds left. West Noble’s Josh Gross drove the length of the floor and put up a shot that rolled off the front of the rim as the buzzer sounded. Though the game stayed within two possessions for most of the way, West Noble’s largest lead was five in the first period. The Chargers led most of the first half until a 3-point buck by Jared Beehler put LaVille up 24-23 with 1:01 to go before half. Rilye Cox would add a basket to give LaVille a 26-23 halftime lead. The Lakeville hosts led 51-43 with 5:27 left in the game, but Drew Miller, Joel Mast, and Josh Gross hit key buckets to keep things interesting until the final buzzer. Cox led LaVille with 17 points, eight rebounds, and three assists. Luke Beehler added 16 points and six assists. Connor Wieczorek chipped in with four assists and four steals. LaVille improves to 14-3 overall. The Lancers prepare for a doubleheader weekend February 8 and 9. Coach Edison’s crew will play host to Hoosier North Athletic Conference rival Triton on the 8th before traveling to Whitko on the 9th. The JV will tip at 6 p.m. each night.